Choosing a Car Camping Tent - Get the perfect tent. Nothing feels better than hiking the trails all day and then crawling into my tent at night for a solid nights rest. However, there have been times where I did not have the proper gear to have a good night’s rest and ended up roughing it, for this reason, I like to make sure that I have the right car camping tent for the occasion. 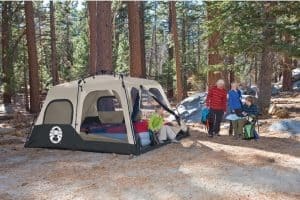 This article will focus on how to choose the right car camping tent for your next outdoor adventure. We will cover tents that require some time to set up for longer stays, tents that can be set up on your car, or fast assembly tents for the night. So, before you head out on the journey make sure you are not the poor man or woman sleeping under the stars on a cold wet night. One of the best inventions in my personal opinion is the ability to camp right out of the bed of your truck. The latest tents designed for cars and trucks are amazing, to say the least. The plethora of roof-top tents will blow your mind. Finding the right one will boil down to a few different things. First, look at the terrain that you will cover and the time of year that you are trying to camp. Will it be cold? What about snow? These things will play a role in the decision process of buying the right tent for the right climate. Another criteria for buying the right tent is the dreadful budget. How much money do you want to spend on an overnight adventure or a two-week journey through the mountains? 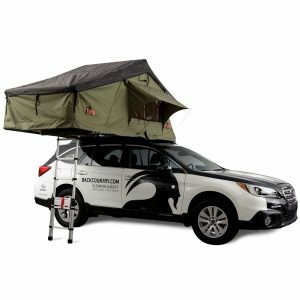 When it comes to choosing the perfect car camping tent for your outdoor adventure it is important for you to do your research. Tents come at many price points, but remember you will never go wrong when buying quality gear for any adventure. For example, you can get a full-size truck tent that literally pops up in the bed of your truck for around $80.00. Then there are tents made by Tepui, that start out at around $900.00 and go up to $2400.00. These tents attach to roof racks to make for easy setup and keep you and your belongings up off of the ground at night. They have great features like built in sky screen panels. The roof top tent is fantastic for easy setup and getting to the fun of camping. Typically, these tents will simply unfold, pop up, and drop a ladder for you to climb up. With a rooftop tent, you never have to invest much time into getting your camp setup. Another beautiful aspect of the rooftop tent is that you have a bit more protection from the local wildlife. Because you are elevated and off the ground you know that many animals simply can’t get to you. More and more companies are beginning to make these types of tents, so make sure you do some research before you make a purchase. I am a traditionalist by nature. When it comes to anything outdoors I am going to go as traditional as possible. I love to fly fish, hunt traditional archery, and to live off the land in the most traditional way possible. Traditional camping is not out of style or outdated, it is really the heart of the outdoorsman. I have seen people use the lean to tents for the solo adventurist, or a standard wooden pole canvas tent for family situations. In the service, some of my best sleep came from a night in the ole’ GP Medium canvas pole tent. You can roll up the sides to air it out during the days or you can drop them down and add the potbelly stove for the cool nights. Just as with car and truck tents, traditional tents can come in many shapes or sizes, thicknesses, and prices. Large family tent by Coleman. For my larger family outdoor adventures, I love to take out my large cabin tent. This tent is durable and spacious for the whole family to enjoy the excitement of camping. The canvas sides are great for rugged outdoor weather. On the downside, many of these car camping tents do not have a floor and you are subject to the ground at night. If you have ever been to El Paso, camping at night can be an adventure in itself. At night everything comes out. When dealing with spiders, to scorpions, to snakes, it is sometimes really good to have that roof top tent or at least a tent with a floor in it. 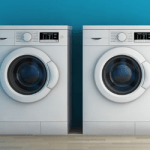 Maybe you do not have a large family to set up like a small army unit, maybe it is just you and your spouse. There are plenty of traditional frame tents for you to try on your next car camping expedition. You will be able to find more pole tents than you can count if you go to your local sporting goods store or search online. The issue most people have with going the traditional car camping tent route into car camping is the time it takes to set up. When you drive all day to get to the best camping spot it is already late and setting up a traditional tent can take some time and sometimes more than one person to set up. Because of these reasons, most people prefer to set up a standard pop-up tent. These tents give you the feel of traditional camping without the hassle of large multiple piece tents to setup. Many pop-up tents only require a couple flexible poles and a few stakes to put up. These tents are tough and compact. Best of all you can find these tents absolutely everywhere from Walmart to REI, to Amazon. Pop up tents are a fantastic way to get into the outdoors at an affordable price. Effortlessly one person can set up a pop-up tent in about five minutes without any assistance. I have at least four Coleman pop-up tents that my family and I have used over the years. Each one of these pop-up tents has a floor liner in them to protect you from the critters out there but if you have ever laid on the ground overnight it can get pretty cold on the warmest of days. When considering your next adventure into the outdoors consider what sounds appealing to you. Consider the environment you will be traveling into. Look at local weather reports for rain, snow, excessive heat, or any other climate changes. Look at the space required to set up the tent you need. If you’re short on space, you may be forced to use a small pop-up or rooftop tent. It is always crucial to do your research of the expedition you are about to embark on and on the gear you will need for that expedition. Whether you’re planning a trip to go fly fishing in the cold Colorado mountains or heading out to enjoy a day of hiking in Arizona, selecting the right tent for your next outing is crucial to how well you will enjoy the adventure. Select a car camping tent based on your environment, your budget, and the weather conditions.